With the rivers now closed, it was time for me to concentrate on the stillwaters to try and catch my target species for the early Spring period. Having not seriously fished for big roach for a few years, these were one of my main targets for the mid-March to mid-May period. One of the pits on a complex that I fish on a regular basis had produced a handful of big roach in the past and although I’d only ever either pike fished, or used the pit as an occasional carp stalking water in the past I was confident that if I could put myself in the right swim and locate some roach, then I’d be in with a chance. Unfortunately, despite a few sessions on different swims around the pit, I’ve yet to put the landing net under a decent roach. However, other species have been keeping the fishing interesting, so it’s been far from a waste of time. My main approach has been with the bolt-rigged maggot feeders on two of the three rods. These have been fished with short braid hooklengths terminating in a small hook baited with double maggot, fished helicopter rig style. Then I’ve fished a third rod on a variety of different methods and baits to see what else might be caught. The first ‘roach’ session produced a 28lb 2oz common carp on one of the feeder rods fishing towards the bottom of the marginal slope and a couple of bream to around 8lb from the deeper open water on a rod fishing a PVA mesh bag of Meaty Marine groundbait threaded onto a short braided hooklink with a single grain of plastic corn hair-rigged to a strong size 10 hook. On the second day of my 2-day session I did receive a few “jiggles” on the bobbins and a few bleeps on the alarms on the feeder rods, but no proper bites indicating that something had hooked itself on the mini-bolt rigs. Trying to strike these “jiggles” resulted in striking into nothing, with further inspection revealing one of the pair of maggots looking a bit chewed up. I concluded that small roach or perch were probably responsible for the little bites and sucked maggots. The only possible sign of a big roach occurred as I was packing up. As I picked up the very last rod off the deck (with the rods rests etc. already packed away) I suddenly felt a fish on, with a few nods of the head, typical of a decent roach, felt down the rod before the fish fell off; leaving me to wind in a fishless end-tackle, with one of the maggots neatly folded over and impaled on the hook point. Subsequent sessions targeting the roach haven’t resulted in any roach type bites at all, but have produced some more bream to a variety of tactics and a couple more carp, including another 20+ on the feeder rods. 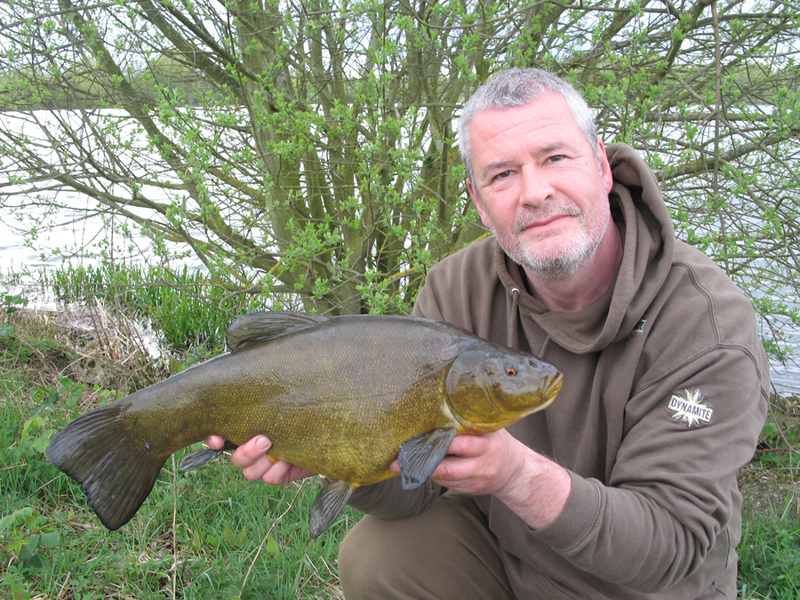 However, the most pleasing fish to “gate-crash” the roach sessions so far have been some quality tench to 8lb 9oz, which have also fallen to the bolt rigged maggot feeders fished on the marginal shelf. 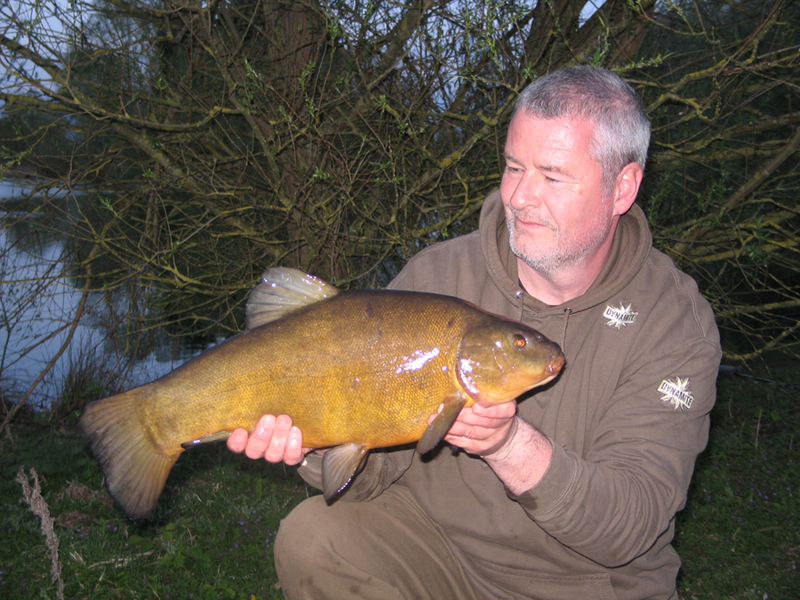 Late March also saw me starting the first of my sessions on a different gravel pit, this time a much larger venue, with tench and bream as the main target. It’s not a water that I’ve fished for a very long time, my previous couple of visits being over 25 years ago when fishing for the pike. A mature pit, with still a nice wild feel to it and a reputation for being a bit of a “heartbreak” water, where a few bites a season would be classed as a good result. My first quick overnight session was a complete blank, with a couple of carp crashing out over the other side of the pit, as the only signs of fish activity. However the next 1-night session did produce a nicely conditioned 7lb tench that came along very soon after having just got all three rods out and getting the main area spodded up with a decent helping of a mix of 3mm Krill pellets, 6mm Marine Halibut pellets, a few handfuls of crumbed CompleX-T boilies and a tin of Dynamite corn. 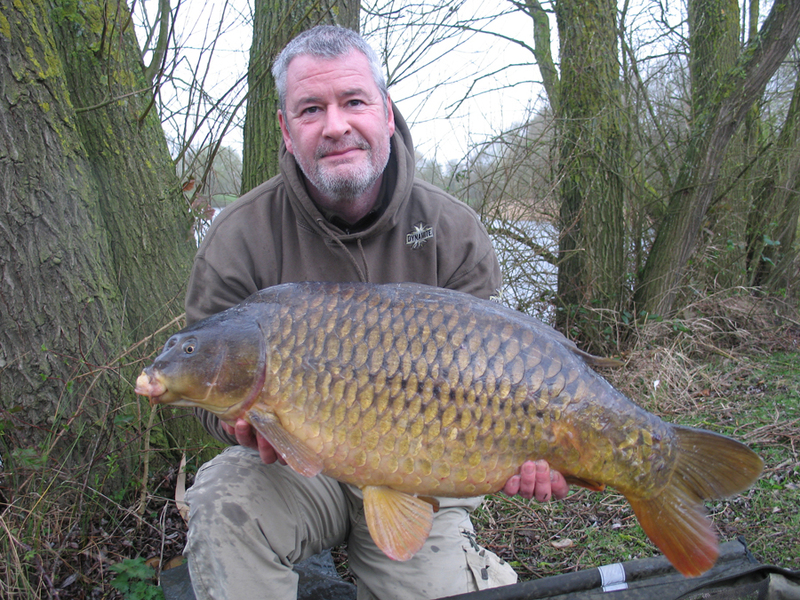 The successful hookbait was a 12mm CompleX-T boilie tipped with a piece of plastic corn. Spurred on by this early success, my next visit to the tench/bream pit was planned to start on the Good Friday of the first Bank Holiday weekend, after having first spent the day representing Dynamite baits at the annual Open Day at the huge Shelton’s of Peterborough tackle store. With it being the first Bank Holiday of the spring and coinciding with some half decent weather, I imagined the pit would be busy with anglers. However, I was pleasantly surprised to find that it wasn’t too busy at all, with only a couple of other anglers present. This was especially pleasing as this was planned to be my first two-night session on the pit and there was a good choice of swims to move into.